Anthony Joseph has been performing as a tribute artist since the age of 10 after he was inspired by the movie Viva Las Vegas. Now at the age of 23 he has won numerous awards in and out of the tribute world. The most recent being in the Karaoke World Championship where he placed 9th in all of Canada. Anthony loves to sing and perform all kinds if music and has even added to his tribute repertoire Sir Tom Jones and Frankie Valli. He has just completed the Applied Music program at Mohawk College and is continuing onto McMaster to get his BA in Music. His passion is to teach music and inspire others for their gift of music. The show Tupelo to Las Vegas is Anthony's baby. Anthony wanted to put something together that was different from a lot of the shows out there. 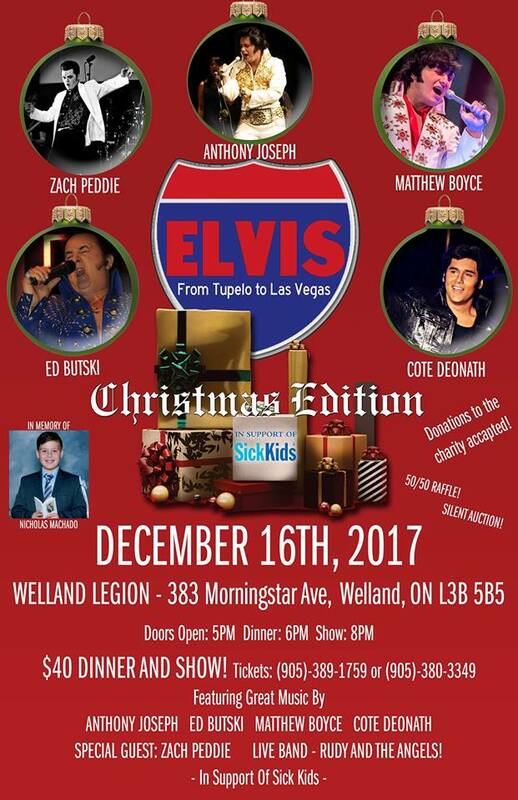 This show is multi-media mixed with live performances that show Elvis's life from Tupelo to Las Vegas aka the name. Originally the show started out with Anthony, Colin, and Matthew Boyce, but unfortunately Matthew became ill and was unable to make it; so Zach Peddie graciously stepped in, and it turned out amazing. So the three decided to do it again. Then when Matt was well again, the three planned on reuniting, but that wasn't meant to be, as Colin couldn't make it this time. So the show still went on with Anthony and Matt. The last time, Matt and Anthony brought back Zach, and a new addition, Cote Deonth from Florida, it was a twist that made the fundraiser for Sick Kids, in memory of a young friend we lost this summer, a HUGE success! Thank you, Cathy, for contributing to this post. Cathy’s upcoming concerts are posted on our website calendar of events. C.M. Post updated: January 8th, 2018.